When life starts to get busy it’s all too easy stop doing the things that keep us grounded, happy and centred. The more we rush to get things done we start to ditch the healthy living practices that keep us calm and in our bodies. Our frazzled mind takes over and the “fight-flight” nervous system makes us do things that create a (false) sense of comfort and safety. For example we may start eating too many cookies, we stop working out, we go outside less, drink more booze, walk less, drive more, sleep less and the snowball builds! Maybe you can relate? These past few months I have felt overwhelmed more than usual, and while It does sneak in I also bounce back fast. 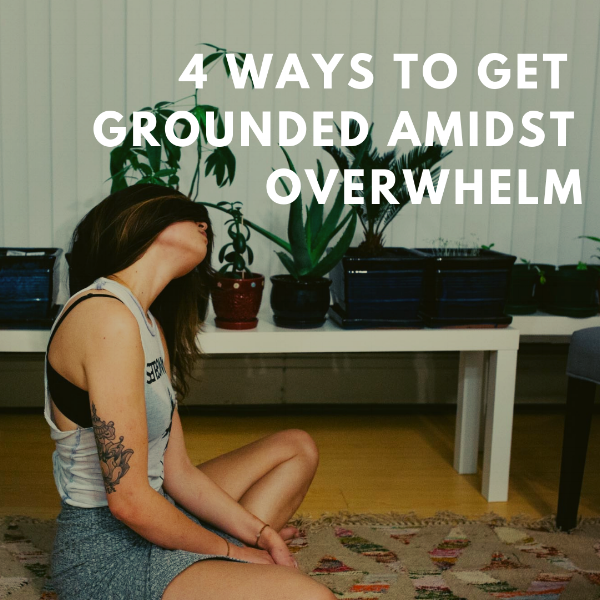 Today I am sharing the most powerful practices I use for myself to get grounded and centred amidst overwhelm. How often do we reach for our phone or coffee first thing? If we start instead by taking a moment to pause, breathe and feel the aliveness in our bodies we literally put ourselves first- the ultimate self-care! Practicing even just 5-10 minutes of meditation the moment you wake up will have a profound impact on how you move thorough your day. If you are new to meditation there are loads of apps you can use or try any of my free meditations: yoga nidra meditation and chakra meditation. When our bodies come in contact with the earth, grass, rocks, soil etc we have an energetic exchange that calms and soothes our nervous system. Taking time to get outside and make contact with the earth is a wonderful way to dispel the spiralling thoughts that come with overwhelm. When we are overwhelmed, while the situation we are in may be a really tough one, the impact is compounded by the mind’s reaction to the situation. We may not be able to change our circumstance but we can intentionally point our internal compass towards all the things that are working out beautifully and wonderfully in our life. When impending doom starts to strike, grab a pen and paper and write out every single thing you are grateful for. Bonus points if you then meditate on one of your gratitudes and really feel that thankfulness humming through your body. Music is such a powerful mood booster, and movement, well— hello endorphins! Get your hormones working against the overwhelm demons and chose your own adventure. Find whatever movement and music makes YOU feel good and throw yourself in with abandon. Ya’ll know I have fairly eclectic tastes when it comes to movement and music. I do love yoga dance parties and shanti shanti music, but for exercise these past couple of month’s I’ve been on a HIIT kick (it stands for High Intensity Interval Training) I’ve also been lifting weights with my bro - he’s a power lifter and offered to train me, fun! Need more inspiration and support with self-care and tending to your inner life? 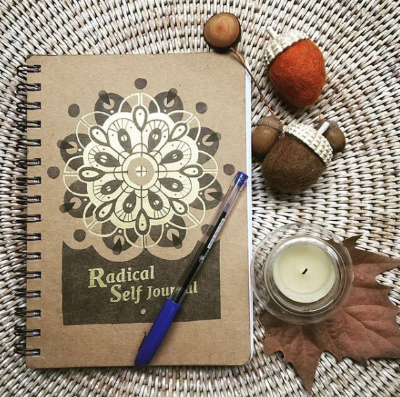 Check out the Radical Self Journal - made with love in Australia it ships world wide and I’m offering 20% off until November 30th. Use code “LOVE” at checkout to get 20% off.